The Style Index : Warm Weather = Lemonade Time! 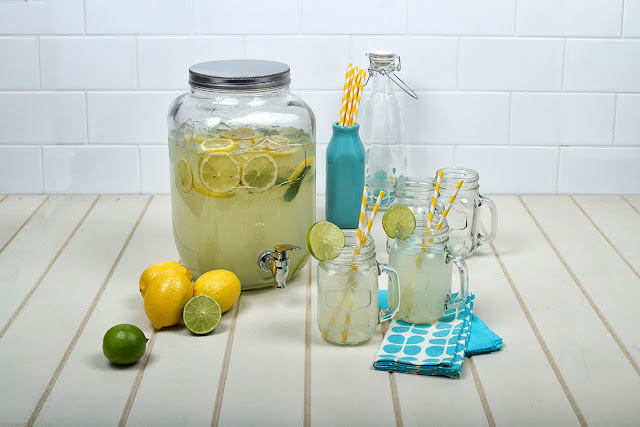 Picture this: Summertime lemonade for sale by the side of the road or out front of the house, with smiling happy children playing shop and a mum or dad watching nearby. It's easy to create such lovely childhood memories with this Retro Beverage Dispenser and Retro Jar Tumbler set. It's part of a vintage-inspired kitchen accessories range from Anna Gare, host of Great Australian Bake Off and Junior MasterChef, and is available via David Jones, Robin’s Kitchen and Domayne. Drink your favourite summer beverage from the tumblers, keeping the rest cool in the dispenser.